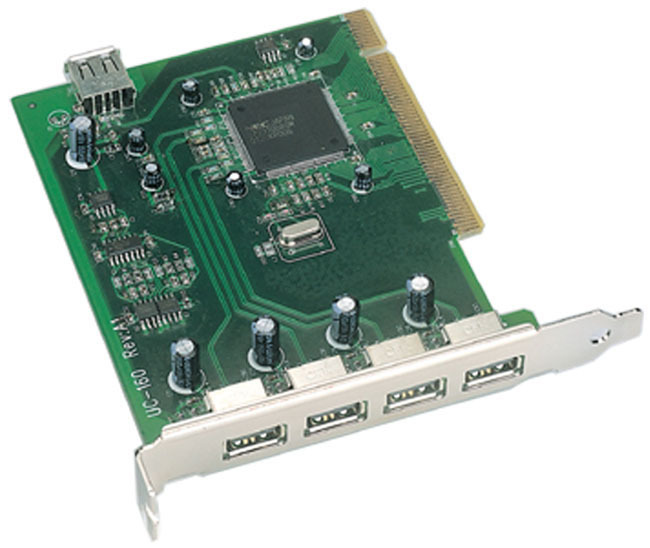 The Model UC-160 is a PCI Bus USB 2.0 add-in card with NEC chip set. It supports both the lower speed USB 1.1, used by most USB devices, and the newer high speed USB 2.0. It can be used to add USB capability to a PC without it, or add USB 2.0 capability to a PC that has USB 1.1. USB 2.0 drivers are furnished for Windows 98SE, ME and 2000. Windows XP has native USB 2.0 support. The card contains five Type A connectors. Four of the connectors are external. Can be used on PCs containing Pentium II 233MHz. (or equivalent) or better.